It's a cold morning under lead-gray skies, but the fans who've trooped to Lima's El Porvenir neighborhood are hot to start the Little World Cup — their annual street soccer championship. To score good seats, people camp out the night before, lining the road where the games have packed the streets every May 1 for a half century. Others pay the equivalent of $2 for a balcony view from apartment buildings to catch the games that Peruvians also call "The People's Party." The working-class neighborhood ritual in El Porvenir began in the 1950s as a challenge to the Manuel Odria military dictatorship when playing in the streets was forbidden. The tournament has been a big focus for Peruvian fans for a while, because the country's national team hasn't qualified to play in international soccer's World Cup since 1982. "Here they play no holds barred. This is for 'machos' and it's crazy to be a referee," said one fan, Teodoro Aquino, who was sipping beer with friends before the day's first game. Aquino has attended the championship for four decades in his crime-ridden corner of the capital. All 56 teams bring along their most fervent fans to defend each goal, and disputes can come to blows, so about 50 anti-riot police officers guarded the asphalt pitch at this year's competition. Police beat back fans trying to invade the field during breaks between games and vendors worked the crowd selling gelatin and baked potatoes. The referees get special protection since half the spectators never agree with a call and the most disgruntled are apt to throw bottles and chicken bones. But the referees don't mince their words and seem to be immune to pressure coming from the stands. Players stop to pray before entering the pitch and fans light flares from the sidelines. At the end of the day, after 30 games, the team from the capital's Purito Barrios Altos neighborhood took home this year's trophy, a $2,500 cash prize and 12 pairs of soccer cleats. One supporter of the winning team threatened rival fans who challenged the final result as he trotted around showing off his team's trophy. 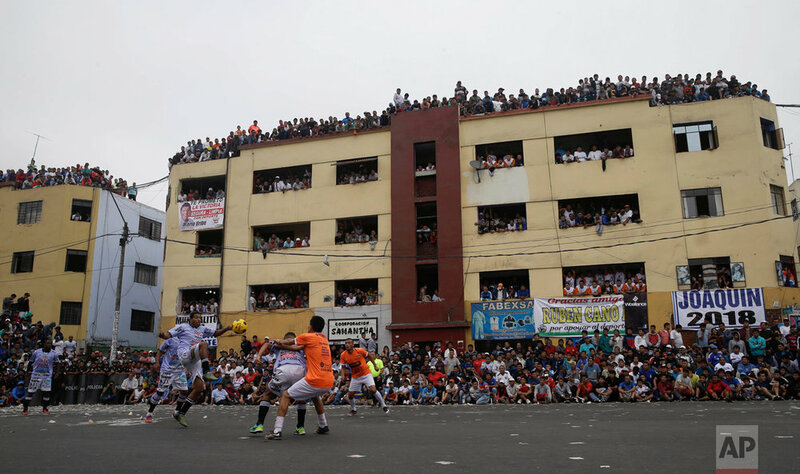 Text from the AP news story, AP PHOTOS: Street soccer tournament packs Lima neighborhood, by Martin Mejia.